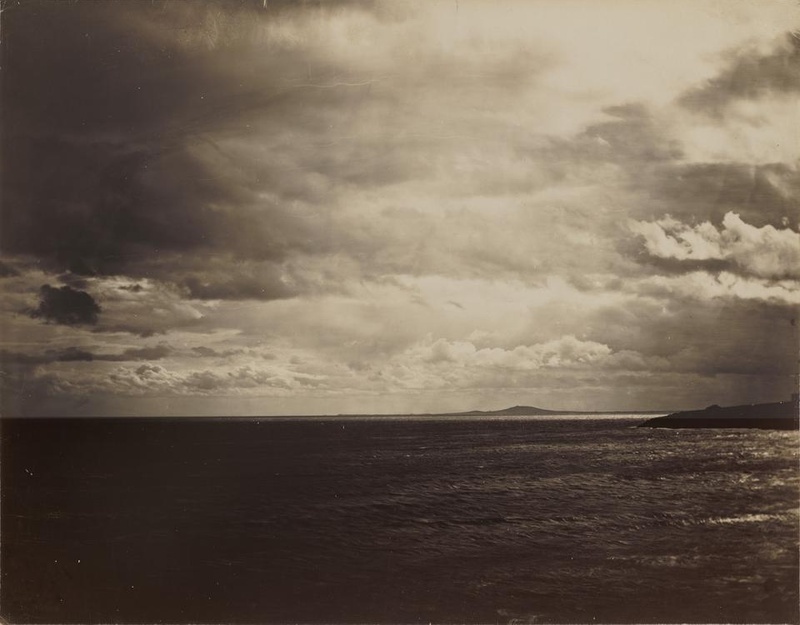 Pictured is Gustave Le Gray’s “Cloudy Sky—The Mediterranean with Mount Agde.” The photograph is an albumen print from wet collodion glass plate negative. The piece is part of a new exhibit, “Silver, Salt, and Sunlight: Early Photography in Britain and France,” that Havinga curated at the Museum of Fine Arts (MFA). The exhibition, which runs until August 5, explores subject matter and techniques of photographers in what Havinga considers the art’s “golden age,” from around 1840 to1870. She stops first at the oldest image in the exhibit, which is not actually a print but a daguerreotype made by French photographer Joseph-Philibert Girault de Prangey in 1842. Daguerreotyping was a laborious process that produced a fragile, beautiful single plate. Its various disadvantages—the cost of the materials, the fact that subjects were visible only from one angle, the difficulty of large-scale reproduction—encouraged photographers to switch to albumen prints, which used paper coated with egg, and salted paper prints. The photos represent significant investments of labor—in addition to traveling with large glass negatives, photographers carried heavy cameras, bottles of photographic chemicals, and makeshift darkroom tents. Each negative had to be chemically prepared and treated right after exposure. “The passion and fortitude of these early photographers is incredible,” Havinga says as she contemplates a picture by Auguste-Rosalie Bisson of mountaineers scaling the Alps. This exhibit comprises only a small sample of the MFA’s photography collection; most of it is available for art students to examine. Asked to point out a favorite image in the exhibit, Havinga shrugs and smiles contentedly at the prints surrounding her. “I love them all,” she says. —Staff writer Ola Topczewska can be reached at atopczewska@college.harvard.edu. An earlier version of this article said that early photographers switched from daguerreotypes to glass prints and salted paper prints. In fact, they switched to albumen prints and salted paper prints. Photographer Berenice Abbott engages in a broader form of portraiture, capturing the various idiosyncrasies of her subjects while preserving her own distinctive artistic style. HAMUC harnessed Halloween to promote the Sackler’s new exhibit in a lighthearted event.